Spas need to apply yearly to be certified. You will note that En Vogue was certified in 2010 and every subsequent year until 2015 at which time we did not apply for recertification. The reason being, that the process is costly and honestly the certification is not recognized by our public. En Vogue still continues to operate with the same level of integrity. 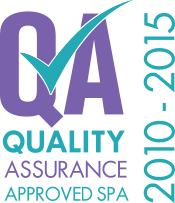 Quality Assurance is a program that was developed in 2010 by the Leading Spas of Canada, verifying that the quality and integrity of the services and practices provided by spas demonstrates that they merit the confidence of clients, staff, government agencies and the general public. A specially trained third party evaluator performs an onsite assessment regarding sterilization, hygiene standards in treatment protocols, equipment, facility safety, cleanliness, staff certifications, education, HR policies, and more. Fact: There is no national system of standards or regulations for the Canadian spa industry. Many provinces have little or no licensing for spa practitioners – especially hair, skin and nails. Schools do not have equivalent educational programs and/or requirements for graduation.